Nina Murano performing at the Bette Asfalt Theatre in Amsterdam. 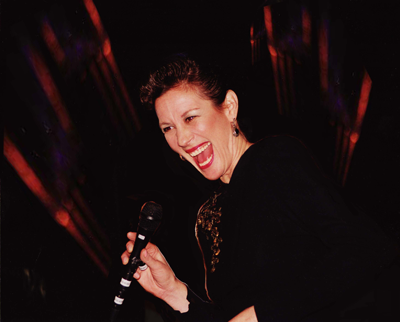 Nina Murano is an award winning Singer/songwriter actor and acting coach in New York City. Nina is the recipient of Backstage’s “Bistro Award” ; The Native’s “ Outstanding Solo Performance Award” and numerous yearly “ASCAP Special Pop Song Panel Awards”. She has performed in Europe and coast to coast in the U.S. Besides the lyric writing for “Zephyr’s Pond”, Nina has been noted in the New York Times for her lyrics and original musical interludes for the adaptation of Langston Hughes premiere version of Federico Garcia Lorca’s “Blood Wedding “(“La Boda de Sangre);” She also wrote, directed and produced her original musical GOOCHIGIRLS at Fordham University Theatre where she is an alumni. Nina has recently been seen on television in a National Network commercial. As past treasurer of Chapter East of the Society of Singers, Nina continues her work on the board of directors helping singers in need. All songs music & lyrics by Nina Murano unless noted.